Some of the most heartbreaking photographs of the Expulsion from Gaza, were of the families of Gush Katif kneeling in their gardens, crying, gently pulling saplings from the earth, carrying them lovingly in their hands as the soldiers led them away. These trees were replanted outside their new homes, the dirt that clung to the roots carrying a piece of the homes they left behind. The uprooted people of Shirat Hayam, while waiting for their new homes to be built, were eager to put down new roots. 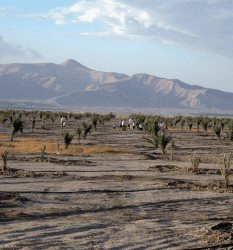 CFOIC Heartland put out a call for these refugees and we were able to plant hundreds of olive trees and date palms in their new community of Maskiot. The refugees were still in temporary homes but with the help of Christian friends, we began to replant, to rebuild. 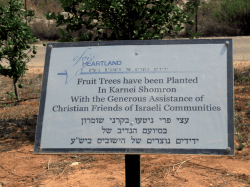 Ever since, CFOIC Heartland has offered the opportunity to Christian friends from all over the world, to plant trees in Judea and Samaria. And we have been planting trees in their name. Our supporters write poignant notes with their tree orders. Mike, from England, wrote: ”May the trees be my legacy to flourish in the land of Israel, long after I have passed beyond this life.” One Australian boy sent money for a tree in memory of his Dad. A family from Tennessee planted trees in memory of their departed loved ones, to honor them and to bless the land and the future of Israel. One woman planted trees in honor of her precious grandchildren! One donor ordered a tree in honor of her sister, who then passed away, and the tree became a tribute to her memory. Bonnie, from CFOIC’s American office, received an invitation to a 50th wedding celebration with the line ‘No gifts, please’, so she planted a tree in the couple’s honor… a gift that keeps on giving. We read in the Bible, that after years of wandering through the wilderness, the People of Israel were commanded: ”When you will come into the Land of Israel, you will plant all fruit trees.” (Leviticus 19:23) Tree planting presents the Jewish People with a wonderful way of settling the land, of making a connection with the land.